Remember that project started by Nicolas Negroponte for the “$100 notebook” (Laptopical first reported on it back in early 2005)? Well, it’s still going strong, despite a recent name change. The OLPC (One Laptop per Child) team have now named the PC the 2B1 “children’s machine”-but they’re also calling it just about done. Yes, the 2B1 is near ready for its prime objective-to provide discount computing to the world’s poorest children. To pull it off, the academics and industry experts who put their heads together, had to completely rethink how a laptop works. Firstly Negroponte’s team are making sure that the Children’s Machine is RoHS compliant. In a few years there won’t be millions of 2B1 hard drives piled up in landfills. Why? Because the 2B1 uses flash memory and doesn’t have a hard drive! Adhering to the EU’s Restriction on Hazardous Substances directive, means that the 2B1 will also limit the use of lead, cadmium, and mercury in the making of the machine. Normally, pcs can harbour a few pounds of lead alone. It’s no wonder that computer equipment is responsible for two-fifths of all lead in landfills. Next let’s look at another green issue, namely power consumption. 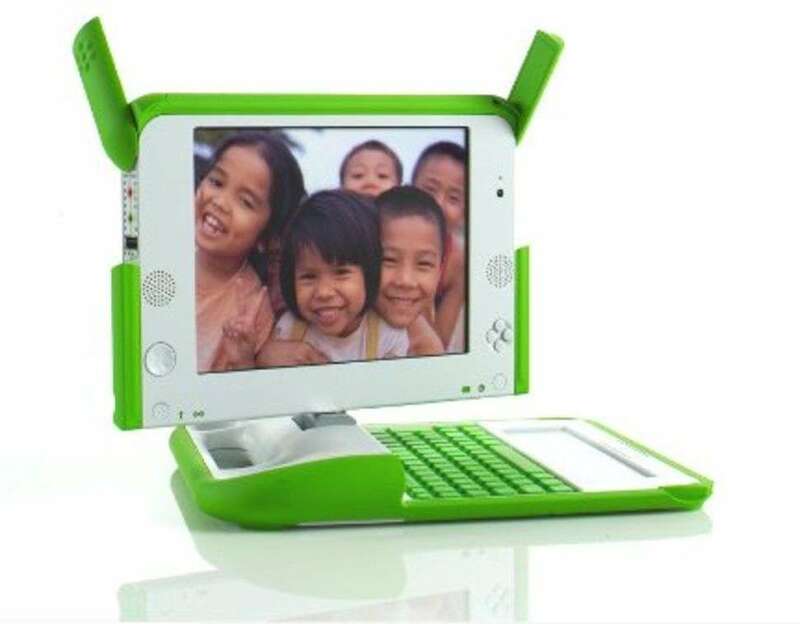 The energy needs of the OLPC Children’s Machine are so little that it can be recharged by human power-no plug in needed. Remember, this laptop is meant for use by children around the world, 500 million of which don’t even have access to electricity. Hence, it comes with a crank, a pull cord, or a pedal for power generation on the fly. Moving on to the display, the 2B1’s 7.5-inch, 1200×900-pixel screen has better resolution than 95 percent of all laptops. It has 2 viewing modes, one for regular viewing which uses one seventh the power of regular LCD laptop displays. The sunlit-viewing mode uses only 1/35. The 2B1’s CPU uses a fraction (1/10) of the average laptop’s power consumption. For very similar reasons, the 2B1 is also an open-source-based computer, which allows the kids to access free software, but also to reshape and recreate other software to suit their needs and creativity. This software includes Csound, a music app. But the 2B1 isn’t some base-model empty box either. It comes with 128MB of RAM and 512MB of built-in flash memory. Its operating system is Linux-based Fedora. And the processor is a AMD 400MHz Geode processor. 3D core 2 duo gaming? – Oh no! – but more than enough for a child in Timbuktu or Tijuana to do homework on. Wait-there’s more. The 2B1 comes with a camera capable of still and video shots, three USB ports, an SD slot, and VOIP capabilities, along with a microphone and stereo speakers to go with. And all of this comes in a package that’s robust (the laptop’s plastic walls are 2.0mm thick) and “kid-sized”. Also it’s capable of transforming into multiple shapes-standard notebook, ebook reader, or simple gaming tool. It is supposed to be able to last five years in kids’ hands. That’s the one part I’m not so sure about.